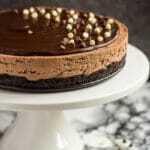 Chocolate lovers – you are going to LOVE today’s recipe. Today, I bring you the ultimate no-bake chocolate dessert. 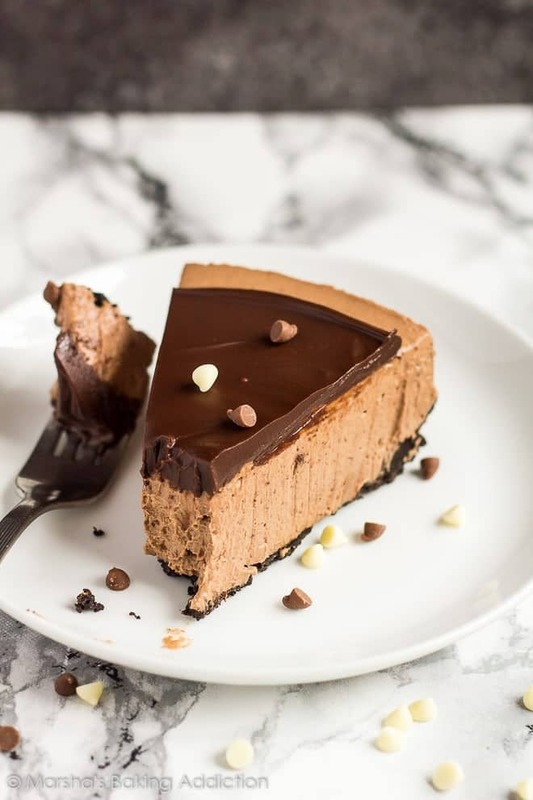 Chocolate cheesecake with chocolate ganache! 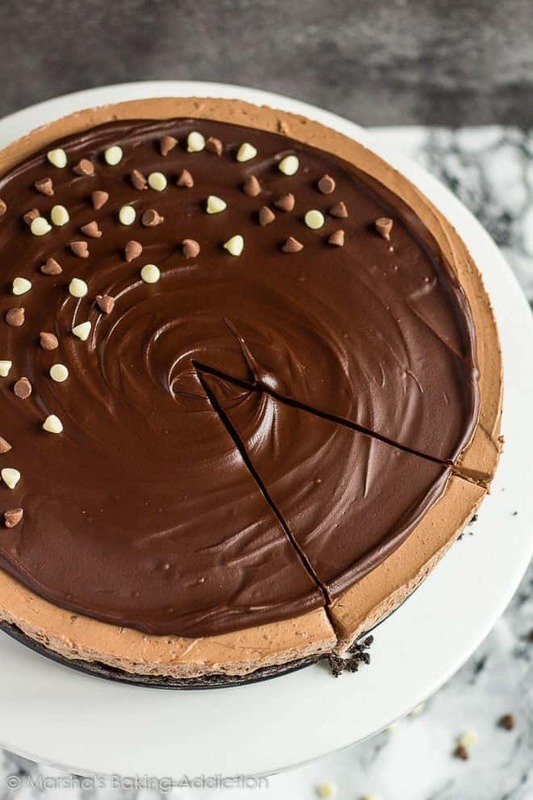 This no-bake chocolate cheesecake recipe starts off with an Oreo crust. The best kind of crust! Simply crush your Oreos into fine crumbs, then mix in a little melted butter. Press the crumbs into a springform pan. Next up, the chocolate cheesecake. Deliciously creamy cheesecake made with melted dark chocolate – mmmmm. Top this with a thick layer of chocolate ganache, a sprinkle of chocolate chips, and you have yourself the ultimate no-bake chocolate dessert! 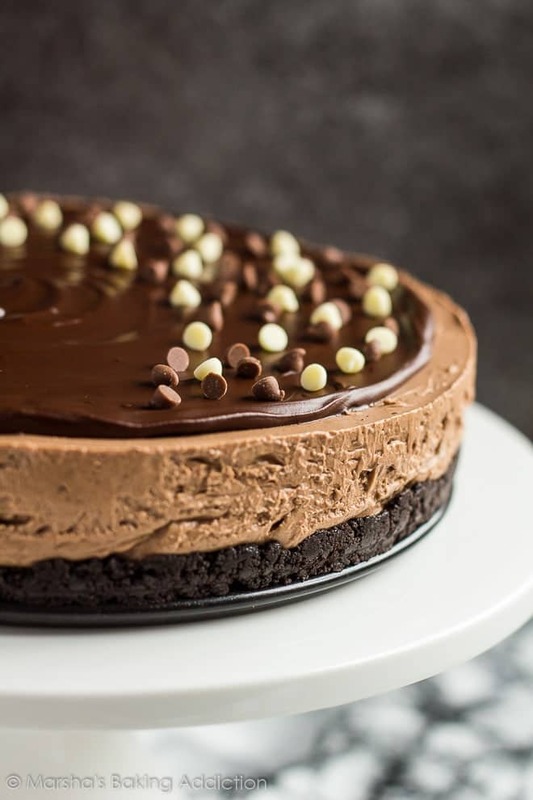 To make this chocolate cheesecake, simply stir together the Oreo crumbs and melted butter until all the crumbs are moist. Press the mixture into a greased 9″ springform pan and refrigerate whilst preparing the cheesecake. Using a handheld or stand mixer, whip the heavy cream on high speed until it starts to thicken. Add the icing sugar and vanilla and whip until stiff peeks form. In a separate bowl, whisk together the cream cheese and sugar until smooth and combined. Add the cooled melted chocolate, and mix until combined. Gently fold in the whipped cream. TIP: If the chocolate happens to harden (seize up) against the cool mixture, microwave the mixture to warm up slightly, then mix until smooth and combined. Spread the mixture evenly over the cooled crust and smooth out the top. Refrigerate for at least 6 hours – preferably overnight. For the chocolate ganache, microwave the chocolate and butter together in 30 second intervals, stirring after each one, until melted and smooth. Leave to cool for 5 – 10 minutes, then spread over the cheesecake. Allow to set before slicing and serving. perfect for serving at parties and special occasions! 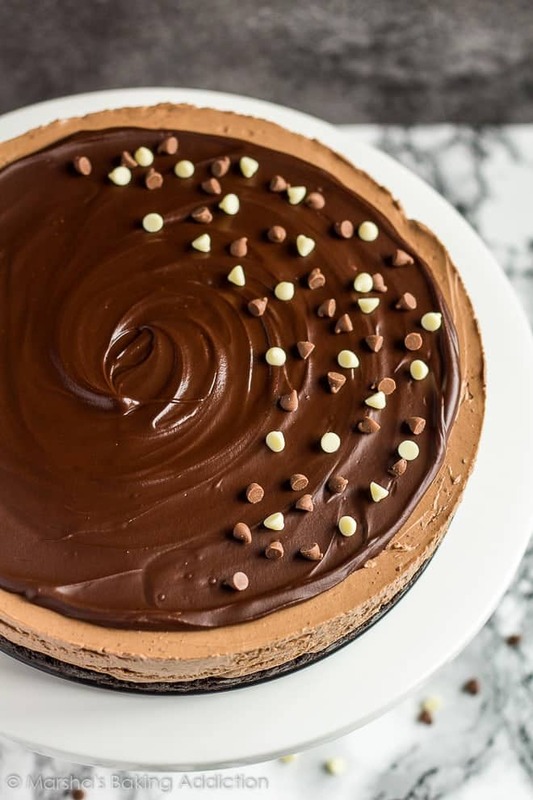 How long will this chocolate cheesecake last? This cheesecake and any leftovers can be covered and stored in the fridge for up to 3 days. Can I freeze this cheesecake? This cheesecake can be frozen, covered tightly, for up to 1 month. Thaw overnight in the fridge before serving. If freezing or making a day in advance, I would make the ganache the day it is being served, as it will become very hard when kept refrigerated. Try these no-bake dessert recipes next! 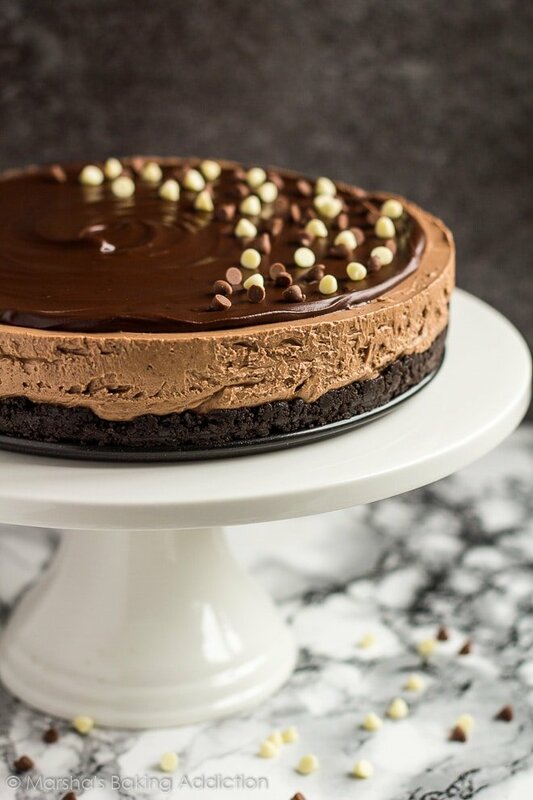 Deliciously creamy NO-BAKE chocolate cheesecake recipe with an Oreo crust, and topped with chocolate ganache! Grease the base and sides of a 9" springform pan and set aside. Stir together the Oreo crumbs and melted butter until all the crumbs are moist. Press the mixture into the prepared pan and refrigerate while preparing the cheesecake. Using a handheld or stand mixer fitted with the whisk attachment, whip the heavy cream on high speed until it starts to thicken. Add the icing sugar and vanilla and whip until stiff peeks form. In a separate bowl, whisk together the cream cheese and sugar until smooth and combined. Add the cooled chocolate, and mix until combined. Gently fold in the whipped cream. Spread the mixture evenly over the cooled crust and smooth out the top. Refrigerate for at least 6 hours - preferably overnight. Microwave the chocolate and butter together in 20 second intervals, stirring after each one, until melted and smooth. Leave to cool for 5 minutes. Spread over the cheesecake, and serve! Leftovers can be covered and stored in the fridge for up to 3 days. This cheesecake can also be frozen, covered tightly, for up to 1 month. Thaw overnight in the fridge before serving. If freezing or making a day in advance, I would make the ganache the day it is being served. It will become very hard if refrigerated. Hi from UK. Just made this cheesecake, really easy to follow and extra special to have these ingredients in grams so better for us folk in the UK. in regards to the Oreos – do you mean the original white creme filled ones & use the creme in the base mix ? Thanks Marsha, am going to make it for Christmas, looks divine. It’s a lovely chessecake, but genache is very hard, to difficult to cut in. And the chessecake I think it need some gelatine, to be more ferm. Hi Lily, if freezing or making a day in advance, I would make the ganache the day it is being served. It will become very hard if refrigerated. Hi all, I did not bother with the ganache, just grated dark chocolate over the top. If you use good chocolate in the mix, it will set well due to the fat/butter content. Hi Marsha, this recipe looks lovely! Does it need instant gelatine to make it firm? Thanks Marsha! I just made it this evening. Hope it turns out well!